Nishikigoi is said to have originated in the district of former Yamakoshi Village (current Nagaoka City) and Ojiya City in Niigata Prefecture. 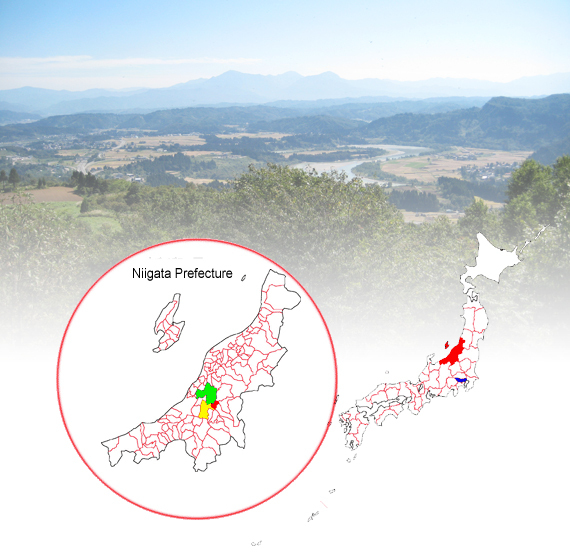 Niigata Prefecture (at latitude 37°55 north and longitude 139°02 east) is located directly above Tokyo, further north than Nagano Prefecture, in which the Winter Olympics was held. It faces the Japan Sea. Since early times, it has been known as a major production area of rice, the staple diet of the Japanese people. It also is abundant in seafood as it faces the ocean. It attracts many visitors in the winter as there are many ski resorts and hot springs. The birthplace of Nishikigoi, Yamakoshi Village, is located in the Chuestu region, located just about in the center of Niigata. Its rich nature and beautiful seasonal scenery make remarkable photo spots and attract many photographers. The residents live a mountain life in the grand mountains with the spirits of “not destroying the nature but living with it. Such scenery is one of the few original Japanese scenes. However, Yamakoshi Village’s winter is harsh. Niigata itself is known as an area of heavy snowfall, but snowfall in Yamakoshi is so extraordinary that snow can accumulate up to more than 4 meters (13 feet). 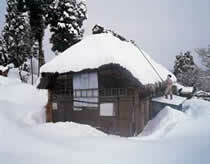 If nothing is done about the snow, the houses will collapse under the weight, so it is a daily routine for family members to sweep it off the roof in winter. This is called “yukioroshi. Until the 1970s, the village was called “the onshore isolated island because it was totally cut off from the outside world. Since the land is surrounded by steep mountains and has little flat areas, the residents (farmers) raked the mountains and built fields called “rice terraces to grow crops. The village is located inland. The residents did not have much access to seafood, so they raised Magoi as a source of wintertime protein in the preserve ponds built to irrigate the rice terraces. Until one day, this Magoi mutated and colored Koi was born. This is the origins of today’s Nishikigoi. ·Yamakoshi Village (Red in left figure)…dimension 15.4miles², population 1,960. *On April 1, 2005, merged with neighboring Nagaoka City. Sister cities…November 9, 1987, Forth Worth, Texas, U.S.A.